Recently I was asked last-minute (as always) to come up with a solution to have a photo slideshow loop all day on a TV during an event. The supplied TV supported playback of various video files, including images, from a USB device, but it did not support playing photo slideshows on repeat. For video files it did, but for the crucial photo slideshow in question it did not. Sure I could’ve hooked up a laptop to the TV and have the slideshow loop on the PC, but since this was at a fair, I didn’t want to take the risk of my laptop being stolen. Therefore, I came up with the idea to save the slideshow as a video file. This turned out to be easier said than done. I knew that Microsoft PowerPoint had the option to export PowerPoint Presentations as video files, but the output file had a codec the TV didn’t support. Since this was the only method I could come up with that met my requirements, i.e. no external equipment, I came up with the idea to convert the video to a different format, hoping the TV would play the file. To do so, I had to find a free video converter. Freemake Video Converter does indeed live up to its promise. It’s free and has no limitations in terms of formats or time restrictions. Using Freemake Video Converter, I was able to convert the exported PowerPoint to the correct video format for the TV to recognize. Apparently it’s either MP4 or the build-in ‘Samsung’ preset, both do the job. 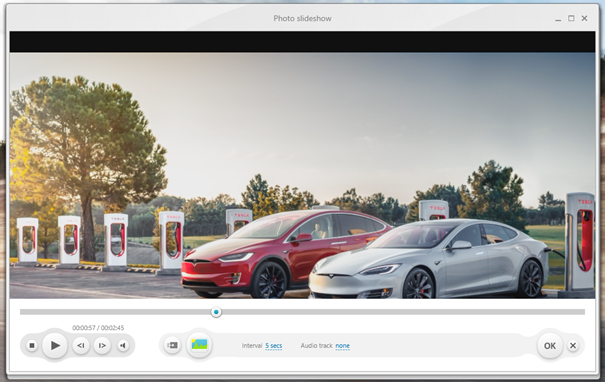 However, Freemake Video Converter also has the option to create its own photo slideshow and allows you to directly convert it to a video format of your choice. It even lets you add an audio track! Sadly the other options in terms of photo slideshow are quite limited; there is just one transition effect called ‘the panorama effect’, also known as pan and zoom, and you can change the interval between photos if you like. However, to unlock its full potential, for example to remove the Freemake logo from the video, you need to pay a small yearly or one-time fee, depending on which feature you want to unlock; each feature has to be unlocked using its own appropriate ‘pack’. For example, there is one ‘pack’ to enable conversion for internet videos such as YouTube, also known as YouTube ripper/downloader, and another ‘pack’ to add subtitles to your video file. If you like, you can also unlock all packs at once by purchasing the ‘Mega pack’, which contains all five packs for one price. All in all, Freemake Video Converter is a great free tool. It’s fast, powerful and easy to use. Additionally, it’s quite feature rich, although some features are locked behind a pay-wall. Should you ever need to convert a video last-minute and you don’t know what the right format is, I recommend taking a look at Freemake Video Converter. You could have used Handbrake, which is awesome, fast and fully featured.